Those words, from mom Stephanie Fish, were sent to mailboxes all over her hometown on Wednesday. Stephanie and her husband Rusty adopted son Sheng from China in June from the Children's Hope Waiting Children Program. 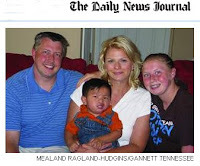 This week, the couple shared the story of becoming a family of five with the Daily News Journal in Tennessee. Read their full story online by clicking here.